There’s been a lot of talk about Jack Ross’ tactics and formation recently, and Will Grigg’s arrival at Sunderland has only added to that. What to do with the striker situation? Charlie Wyke, was bought by Sunderland as a first choice striker after impressing the previous few seasons at Bradford City. Grigg, similarly, was brought to the Stadium of Light to be first choice. In a system where only one out and out striker is emplyed though, can they both fit in? Interestingly, Grigg is here to replace Josh Maja after he departed to Bordeaux in January. Maja was supposed to only be a youngster who maybe would get the occasional game this season, but after going into the first game of the season against Charlton as the only fit, recognised frontman, the rest is history. 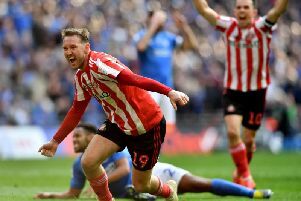 His departure means Sunderland must look elsewhere for goals and the two men with excellent goalscoring records at this level need to step forward. Wyke has been sidelined with a knee injury for most of the season but has still featured 12 times this season, scoring twice (though just one arriving in the league). Overall, Wyke has scored 24 goals in 81 League One matches, Grigg has scored 96 goals in 250 appearances in this league ahead of his eagerly awaited debut for Sunderland, which should be this weekend at Oxford. For me, Wyke and Grigg should be played up front together for a few games to try and get a partnership going. Wyke has seemed to perform better with a strike partner, as seen at Blackpool when he put in one of his better performances when partnered with Maja in attack. The Black Cats have an impressive record of scoring in every game this season but have struggled to get more than one goal in recent games. This is why I believe the two strikers should partner each other for the time being. The club signed two strikers on deadline day, the other being Tottenham loanee Kaziah Sterling. The 20-year-old has just been named the Premier League 2 Player of the Month award for his performances for Spurs U21s and came on for his Sunderland debut from the bench against Wimbledon at the weekend, looking a threat going forward. Sterling earned this deadline day loan move after seeming to have outgrown youth football. Hopefully the young striker offers some healthy competition for Wyke and Grigg in the coming months. If playing with two strikers doesn’t go well for Sunderland an alternate would be to try Grigg as a lone striker, just like Maja for most of the games he played this season. Grigg often played as a lone striker at Wigan so it’s not as if he won’t be used to it. In fact, he was up front on his own during a 7-0 win at Oxford for Wigan in which he scored a hat-trick, a game which also featured two Max Power goals. Here’s hoping that’s a happy omen for tomorrow.